When registering you will be asked to choose one of three social events. Read more about these below. Koldinghus is Kolding’s old royal castle,built in 1268 by the king to defend the country’s southern borders. The castle is now a museum and known internationally for its many excellent exhibitions of art, silverware, interiors, and jewelry. The present exhibition is called The Splendour of Power. The exhibition contains a selection of magnificent and unique Danish and European jewelry worn by royalty and people of power to show – indisputably - their status in society. 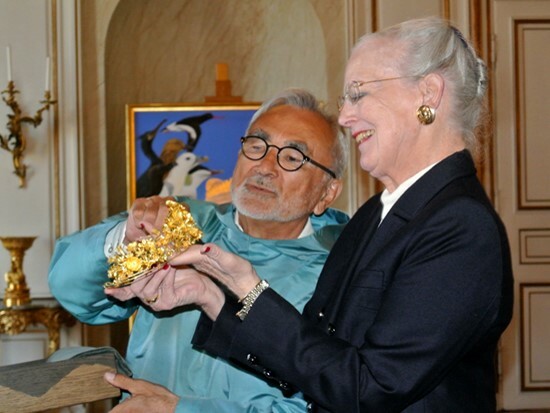 The photo shows her Majesty Queen Margrethe the II and goldsmith Nicolai Appel with the tiara ‘Naasut’, Greenland’s gift to the queen to mark the 40th anniversary of her reign. For those who would like to try out their deftness at archery, an archery event has been organized. Try archery in Robin Hood style and hit the archery disc from different distances. We will start training on targets at a distance of 10 m and progress from there. The further away we come, the harder it will be to hit the targets. Various challenges will be set up for you: blind shooting, shooting after objects such as balloons, 3D animals, and other challenges yet to be disclosed. The whole event will be designed as a competition between individuals and/or teams. Or rather not. The sun hardly sets in June, and we would really like to be backin time for dinner. But take a sailing trip on Kolding Fjord on the old schooner, Frem. Enjoy the beautiful landscape around Kolding Fjord from the water, and relax while listening to the gently lapping water and billowing of sails. The number of participants for this event is restricted and it will be a case of ’first come – first served’. Register today and up your chances of participating in your favorite event.